It shouldn't be surprising. Outstanding natural features are the result of common natural processes working together ... things like chemistry combined with erosion from rain, rivers, seas and wind. These processes are not confined to one place. Even when a particular feature - like a wave shaped rock - needs a specific set of ingredients and conditions, it's not uncommon for that to occur in more than one place. 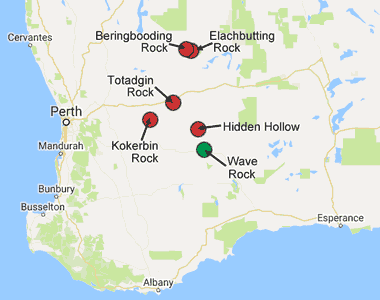 A large area in the wheat belt of Western Australia has the geology and climate that makes wave shaped rocks possible. 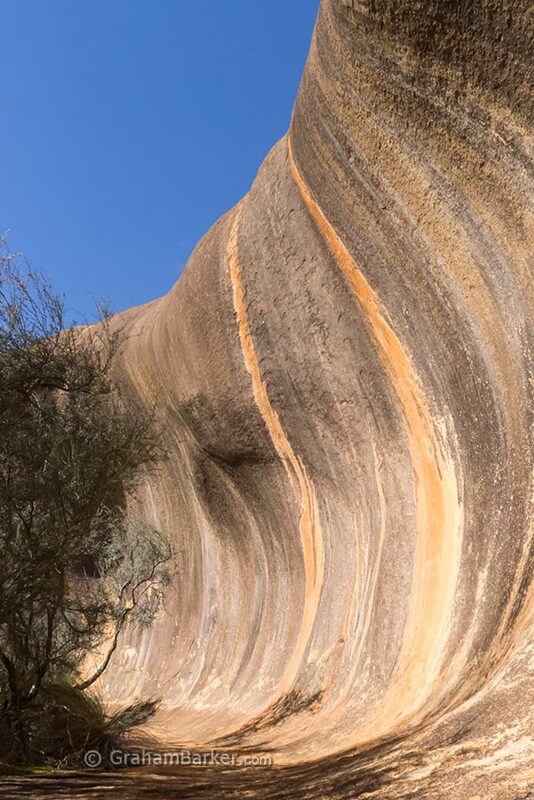 Wave Rock near Hyden is the biggest and most photogenic example of a wave shaped rock, but another good one can be found a few hundred kilometres to the north. 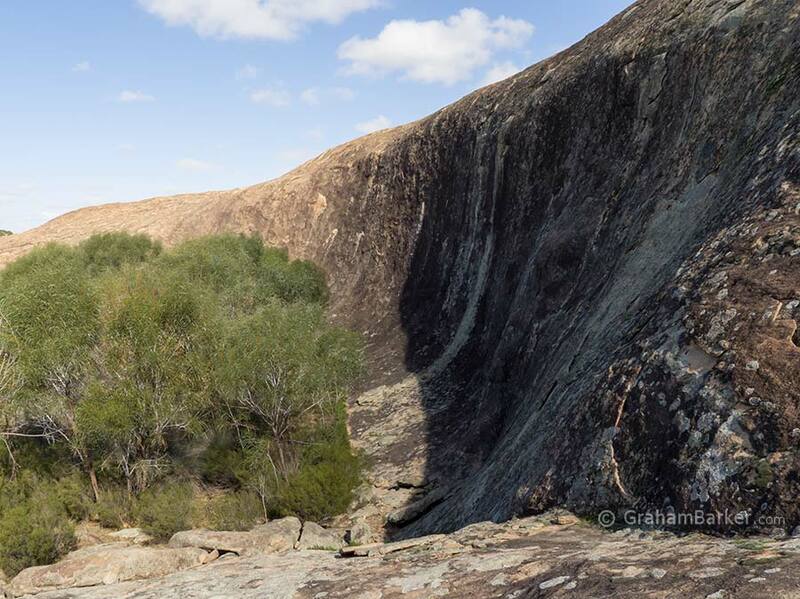 Elachbutting Rock, 100km north east of Mukinbudin, is probably the second-best example. 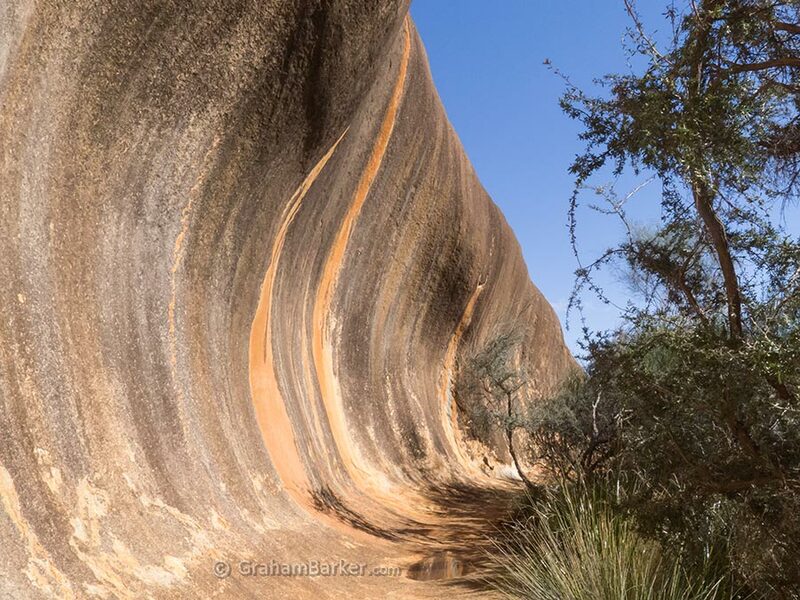 Not as high or extensive as Wave Rock, but still very striking, and if photographed from the right angles the resemblance is clear. 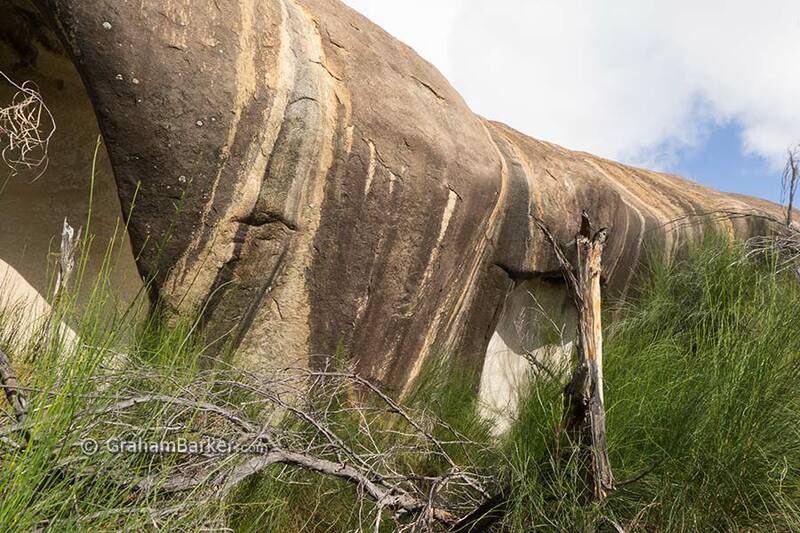 Unlike Wave Rock, Elachbutting has no paid parking, souvenir shop or hordes of visitors. For some, that easily compensates for the rock being slightly less impressive. Also there are other features to explore. In the same general area, 65km north east of Mukinbudin, is Beringbooding Rock. The wave-shaped part is poorly developed; really just a curved overhang in a nook with a waterhole. 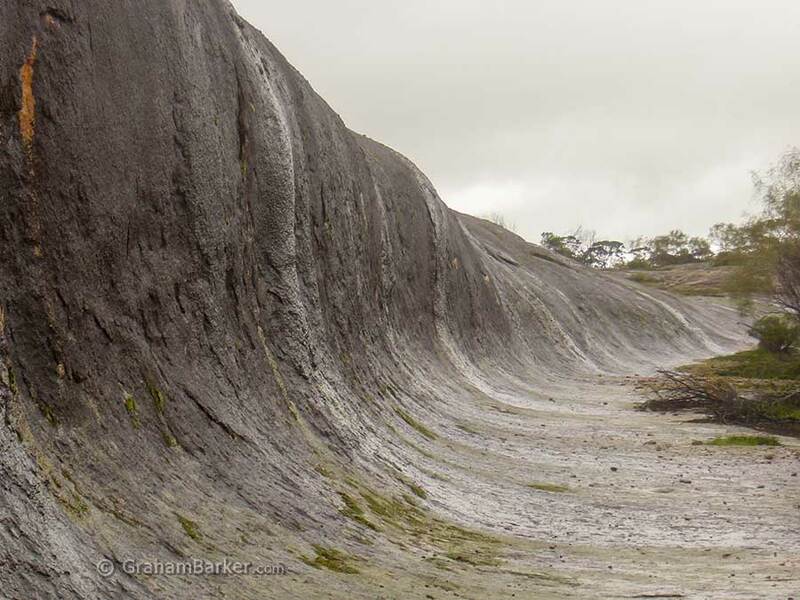 But it's the same sort of structure, caused by the same factors that gave us Wave Rock. In a few million years it might look more wave-like. Until then, there are other reasons to visit. Kokerbin Rock, 40km west of the town of Bruce Rock, also has a wave-shaped section. It's one of the first features along the walk trail which goes from the main picnic area to the summit of what is reputed to be Australia's third largest monolith. I found the Kokerbin version of a rock wave far less impressive than Elachbutting and Wave Rocks. It was also harder to get a clear view because of the vegetation growing right up to it. Yet it is clearly the same type of feature. About 30km east of Narembeen is Hidden Hollow. Here a walk trail passes a sheltered hollow in the side of the monolith known as Mt Walker. It's not promoted as having a wave-shaped rock, but the surface above the hollow has that distinctive curve, although without any overhang. It's a rock wave under construction - just needing a few more million years of erosion to form, with the potential to become quite impressive. But wait, there’s more! 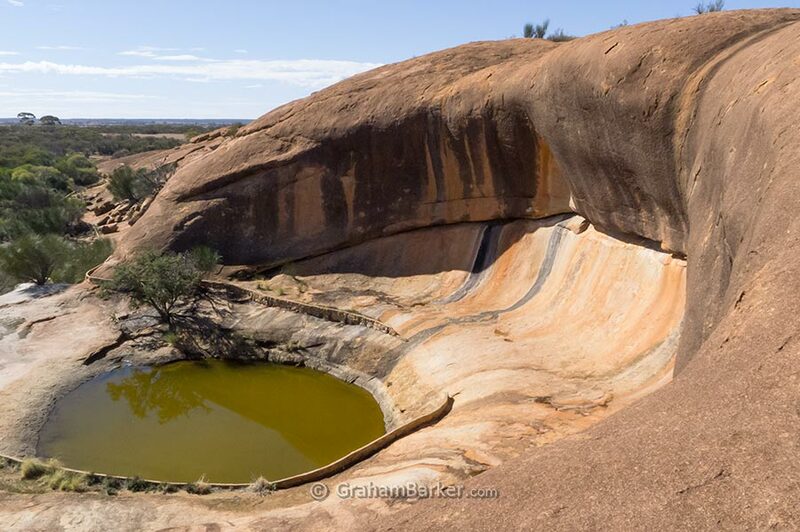 A small version of Wave Rock can also be found 14km south of Merredin in the Totadgin Conservation Park. While exploring the walk trail past Totadgin Rock I came upon another rock wall with a familiar look. Yes, it was that distinctive Wave Rock shape, only less developed and much smaller. Natural forces which create an outstanding rock formation have probably created other less well known examples of the same type. The others may not be as impressive as the famous version, but can still be interesting or picturesque in their own way. Keep your eyes open!